There’s nothing like the first sip of a freshly made cappuccino in your local coffee shop. With the classic milk frother, you can now recreate this moment of relaxation at home. There is no need to invest in an espresso machine and expensive equipment. This fantastic value for money option is an easy way to create your favourite beverages without leaving the house. With some creativity in the kitchen, there are many possibilities with this easy and convenient device. This manual device is the perfect accompaniment for your hot drink routine. What is the difference between a manual vs electric milk frother? Without investing in an espresso machine, there are two main options to choose from for home milk frothing, manual and electric. Both are great options, but it depends on what you are looking for and your needs. A portable device that can be taken anywhere. They are usually all dishwasher safe and easy to keep clean. A safer option for children as no electric feature is involved. A very quick way to froth milk. Requires less effort for the user as the whisk does all the work for you. Usually smaller than a manual device which is more convenient for travel and packing. What is the best manual milk frother? When purchasing a product for your food and drink requirements, it is very important to do some research before making your decision. Always make sure the product is made with high quality materials that are going to last through many uses, are practical and easy to maintain. This product is very easy to clean and keep hygienic due to the glass body. It will last through many coffee making creations and will continually give you consistently smooth results. The premium stainless steel lid is fire resistant and gives a sleek look to the design. How do I use a manual milk frother? Make sure you have chilled, fresh milk. If you are a beginner, try using skimmed milk first as it holds the structure of froth better at room temperature. Pour the milk into the glass body. Quickly pump the plunger up and down for about 30 seconds. Then remove the plunger and put the glass body into the microwave for about 25-30 seconds on high, but make sure it doesn’t boil. Pour the milk into your coffee and enjoy your frothy beverage. 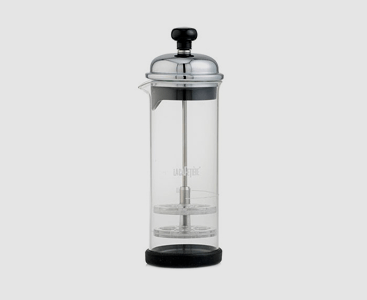 The La Cafetiere classic milk frother doesn’t just have to be used for cappuccinos. There are so many ways to use this device. Lattes and cappuccinos are a must try, but we also recommend trying chocolate, vanilla or fruity milkshakes. Cocktails are also a great way to use this device. Our top picks are a White Russian, Tiger’s Milk, White Plush and a Scorpion.